So What Makes A Proper Present? Proper Presents is my gift ideas blog. It's my platform for sharing amazing experiences, hampers, and gift ideas with my readers. To ensure your time isn't wasted, I only cover products and activities that I would buy myself. I'm not interested in cheap novelties, clearance deals, or other tat. My promise to you is that you will only find high quality, fun, and beautiful gifts on Proper Presents. So, what exactly makes a Proper Present? Some of the top gift ideas I've come up with over the years originate from a vague idea or flippant comment. From there the seed grows and the idea morphs from something airy fairy into something practical. I don't always get it right (I'm not sure the vacuum cleaner was one of my finest moments) but I know what it takes to pull off giving the ultimate gift. Think about the gifts you've received over the years. What stands out? What do you remember most? The chances are it was the items that were interesting or exciting. They captured your imagination and tantalised your taste buds. Look for ideas that are different to what they would buy themselves. Little twists or quirks that make something that little bit extra special are perfect. Look for items that would put a smile on their face. Groceries, essential clothing, and home appliances aren't normally known for their amazing gift qualities. Instead look for artisan delicacies, luxury or quirky clothing, and genuine time-saving gadgets. 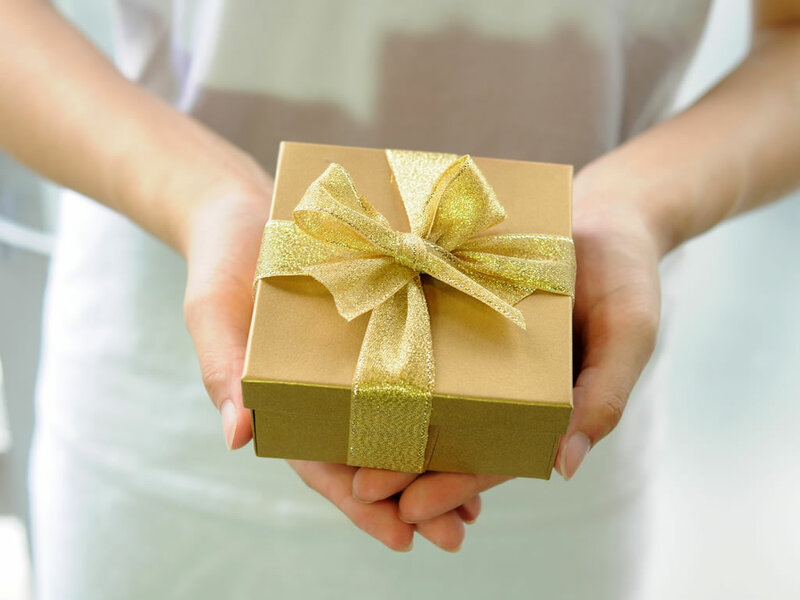 When we buy gifts we tend to gravitate towards what we like, rather than what we think the recipient would like. It's easily done, and can lead to disappointment (for one person at least) on the big day. Think about their interests, hobbies, likes, and dislikes. Put yourself in their shoes and think about what they would like to receive as a gift. What has their name written all over it? Awesomeness needn't come at a price. Certainly, there are gift ideas with price tags that bring tears to your eye, but bargains can be sought too. Value doesn't always mean cheap. Good value means finding a great gift for a fair price. When I win the lottery, I will splurge on designer gifts and unforgettable experiences. But until then, I set a budget and then look to get the best items I can within that. By all means be a savvy shopper but I personally prefer to work on that basis of getting the biggest bang for my buck. This one is most applicable for families where children may slip up.I've lost count of how many times my three-year-old has blabbed over the years. Beware though as surprises can backfire. If you are planning a surprise trip, make sure everyone involved can take time off work. You'd be mad if your grand plans fell apart because of this. First, are you on my newsletter list? If not, sign up right now to receive suggestions right in your inbox. Follow me on Twitter and Like me on Facebook to receive ideas in your social feeds too. Next, decide what type of gift you want to buy. Are you after a once-in-a-lifetime experience, a gift hamper, a short break, or something else? From there, make a short list of what you like best. Remember, the gift isn't for you so put yourself in their shoes. What do they like doing? What floats their boat? Set yourself a budget to narrow down the options. A romantic weekend in Paris might sound perfect, but finding one for £20 will be nigh on impossible. Most of all, keep it a secret. The surprise factor is crucial for maximum impact. Gift cards are almost always welcome gifts. While not as versatile as cash, gift cards show some thought has gone into the gift. Amazon sells e-vouchers which can be delivered instantly. Experience day retailers like Buyagift° or Red Letter Days° sell choice gift cards that let the recipient choose their own gift from a selection. Flowers are a top pick and can be purchased online or locally in supermarkets and even some petrol stations. Look out for a long shelf life to get more bang for your buck. Consider buying a bigger bunch or two smaller bunches for maximum impact. Chocolates and confectionery are a staple of most gift giving occasions and you can rarely go wrong with a box of treats. Look out for artisan options or posh takes on standard nibbles rather than the fail-safe boxes of mass-produced confectionery in the supermarket. DIY vouchers (essentially IOU vouchers) are perfect where you want to give something that requires their input. For example, booking a short break might not be sensible if you don't know where they'd like to go or when. But once you've revealed that you want to whisk them away somewhere special, they can be involved in the decision making process and you take care of the financial side of things. Cash if all else fails.